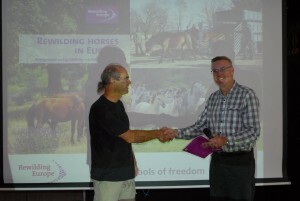 “Rewilding horses in Europe” – why, how, which and where? 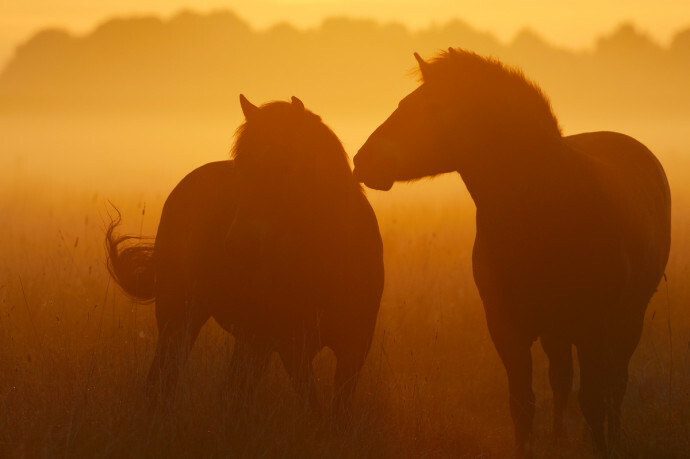 Rewilding Europe today launched its new study “Rewilding horses in Europe”. It is the first of its kind on this exciting topic, providing the necessary background information as well as practical guidelines. This well illustrated, 48-page study was presented at the Eurosite workshop “Living with wilderness” in Haarlem, The Netherlands on September 17, by Rewilding Director Wouter Helmer. The first report was handed over to David Parker, Board Member of Eurosite. Leo Linnartz, one of the authors of “Rewilding horses in Europe” handed over the first copy of the study to Eurosite Secretary David Parker. ”This document guides the reader through the rich world of European horse types, makes a first selection of which horses that are suitable for rewilding and then gives guidance on how to rewild horses in the best possible way, according to the latest scientific and practical knowledge”, says Frans Schepers, Managing Director of Rewilding Europe. ”Since this kind of knowledge is developing rapidly, this document must first and foremost be seen as a living document and this is also how Rewilding Europe will use it. It reveals our practical experiences from rewilding horses in different ecosystems in Europe and at the same time presents the latest scientific research finds. With it, we hope to contribute to an ultimate rewilding goal: well-functioning European ecosystems, with the full range of keystone wildlife species present, and the wild horse being one of them”.